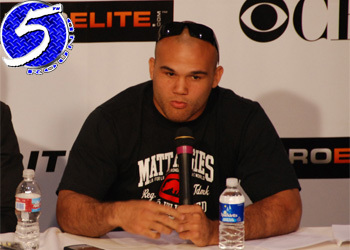 It was announced at yesterday’s Strikeforce press conference that EliteXC middleweight champ Robbie Lawler would be headlining their May event against Jake Shields at a catch-weight of 182-pounds. He’ll take this fight for now, but he expects a title shot sooner rather than later. Lawler’s life and career have been put on hold since his last bout with EliteXC in July. He is thankful that his employment search was shorter than what most other Americans are going through. Although he is happy to have found new employment, he would have rathered to renegotiate his EliteXC contract, instead of having it transferred over to Strikeforce.